We make every effort to ensure products you purchase from Evaris arrive in tip top condition and we hope you're pleased with your ordered items. We appreciate however that there are times when you might need to return items to us. This policy sets out our returns process and the associated terms and conditions. In all cases where goods are to be returned to us, you must submit to us your returns request by emailing websales@evaris.com to begin the returns process (in each case within the timeframes set out below). No returns claim will be accepted unless you are in possession of a valid RMA number issued by us through this process. An RMA number is valid for only 14 days. You must ensure that the goods are returned to us (or made available for collection, as applicable) within this period of 14 days. Failure to do so will require you to obtain a new RMA number through the process outlined above. Please also note that where any goods are to be returned to us, you are responsible for the goods and will retain the risk in the same until such time as they have been returned to our premises (or those of any relevant third party). We are not liable for any damage or loss in transit of goods returned to us. Unless we state in writing that it is our expense, the cost of returning any goods to us is at your expense. For all returns claims, the cost of any transport of goods from us to you will only be covered by us where our error caused the need for the return or where the goods supplied by us have been tested and found to be faulty/defective through no fault of your own. Other such costs are at your expense. All goods returned to us for any reason must be in their original issued condition with no labels or other markings removed or tampered with. The goods must be properly packed and packaged (using an outer cover) and returned along with all manuals and other documentation which accompanied them upon issue. The goods must not be defaced, damaged, altered or otherwise be returned to us in a condition which makes them unfit for re-sale (except for defects / faults which were present in the goods upon issue by us). The RMA number should be clearly visible on a label on the outer covering. We may reject the return of any goods that do not comply with the requirements of the previous paragraph. If we accept the return of such goods (which will be at our sole discretion) then we reserve the right to charge a re-stocking / handling fee. Please note: return requests will not be accepted from any customer whose account or accounts have been suspended for any reason. You should be aware of the Pixel Tolerance thresholds that may apply to goods supplied to you. This may affect the validity of any defective / faulty goods return claim. Further details of such thresholds are set out on our FAQ page. In the case of goods covered by a manufacturer or other third party warranty (we advise you on this when processing your return) you must contact the manufacturer or other third party direct in the first instance who may be able to solve your problem without the need for return of the goods. 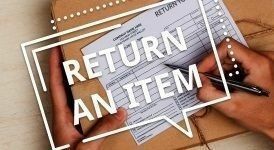 If they tell you to return goods to us, you must ensure that all their instructions are followed (and where applicable their test report / call reference number accompany any returned goods) to enable us to assist with your claim for the defective / faulty goods. In the case of goods covered by our own warranty protection, where a returns request is received that such goods are faulty / defective and the request complies with the above requirements of our returns policy, we will deal with the claim for defective / faulty goods in accordance with the relevant sections of our standard terms and conditions of sale. If returned goods are found to have no faults (or faults / damage which are clearly caused other than by us) then there will be a minimum re-stocking fee of 25%. The percentage of re-stocking fee will depend on, amongst other things the amount of labour involved and the condition of the packaging and contents of the returned goods. If items are missing from the product(s) you've received you must submit a returns request within 7 days of receipt of the ordered goods.This gives us sufficient time to arrange for the goods to be returned, investigate the reason for the missing items and, if necessary, arrange for the supply of a replacement product. If delivered goods do not match your order or the delivery note (whether because too many, too few or the incorrect goods have been delivered) then your return request must be submitted to us within 2 business days following delivery. Any notification to us must include the product name and serial number, the order and courier consignment number and details of the defect(s) in question. If goods are delivered to an incorrect address and the correct address has been stipulated on your purchase order then your return request must be submitted to us within 48 hours of delivery in order for us to rectify the problem. Any incorrect deliveries notified after the 2 business day notification period will not usually be accepted. Any incorrect deliveries notified within the notification period and which were made due to an error by us will be collected at our own expense and our mistake corrected as soon as possible. If goods are ordered in error (whether because too many or too few were ordered or the wrong item was ordered) then a return will be considered subject to the item being in the condition in which it was received by you and the return request being submitted to us within 30 days of delivery. Returns requests received outside of this period will not normally be accepted. A minimum 15% re-stocking fee will be charged on incorrect orders. Incorrect orders which have been opened will be considered in certain circumstances but will be subject to a higher re-stocking fee. In the case of goods which have been specially ordered, custom built or otherwise tailored to your specific requirements, a return is not usually considered. However, you can still submit a returns request via our website. We will review each case and may be able to offer a return subject to a higher re-stocking fee. If you wish to cancel an order which has previously been accepted by us, you must submit a returns request to us as soon as possible. Acceptance of your request will be at our absolute discretion. Any acceptance of your cancellation request will include a condition that you shall hold us harmless in full against all loss (including loss of profit), costs (including the cost of all labour and materials used), damages, charges and expenses incurred by us as a result of your cancellation. This will include, but shall not be limited to, a 15% re-stocking fee based on the original price of the goods. If you receive an order for which your cancellation has previously been accepted by us, please inform us within 2 business days following delivery and we will arrange to collect. You must ensure that the damage is noted on the delivery drivers’ paperwork and also ensure that the driver is aware of the damage. You must e-mail a photograph of the damaged item(s) to returns@evaris.com/shop and submit your returns request within 2 business days following delivery of the relevant goods. Transit damage claims may not be accepted if the delivery has not been signed for as damaged or unless proof of loss can otherwise be shown, or if your returns request was submitted outside of the 2 business day period referred to above.